There are episodes in the overwhelmingly puzzling UFO case series that prevent logical reasoning. We are talking about close encounters where the witness is able to recognize different elements ("family") in the alleged alien craft and its occupants (ladders, uniforms, hats, letters, numbers, antennas, etc.) that would point to a supposed "alien technology" to mimetic that of humans, as if the unidentified crew members conducted a "pantomime" in the face of unsuspecting observers present, before their eyes, which is clearly recognizable and similar to the psyche of the witnesses and as what you might find on any other machine on earth. 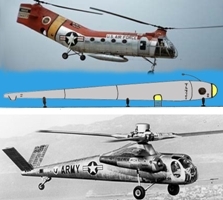 Although initially hypothesized secret aircraft of military origin could explain many of these sightings, and hence the presence of these mundane factors and ordinary assumptions embedded in a vehicle from the confines of space would be logical, but in other events, overall strangeness of the encounter rises to its maximum power. Our admired John Keel said with great success in his book UFOs: Operation Trojan Horse, "the hilarious mystery of flying saucers slowly transformed into a complicated series of coincidences and paradoxes as we enter the data, without taking anything, and considering all as objectively as possible. " A clear example of what we try to expose is what we find in a dramatic and disturbing case in the sixties in the United States that brought about an official government investigation. The detailed description made by the principal involved leaves no doubt as to the complexity of the UFO phenomenon, showing that "everyday" and "extraordinary" go together to override our ability to analyze and understand. No other single incident could present such an amount of absurd and paradoxical details that would only serve to undermine the credibility of the witness's story. On the one hand his testimony appears to reflect the fleeting encounter with a military prototype, but nevertheless, if we analyze his account, it is noticeable that the rate of strangeness of it leaves the door open to all kinds of speculation. Mr. William "Eddie" Laxton, an electronic engineer for 56 years at Temple, Oklahoma, experienced a unique encounter with the unknown. It all started about 5:30 am on the morning of March 23, 1966, on a stretch of Highway 70, between Oklahoma and Texas, where Mr. Laxton routinely drove to his teaching job at Sheppard Base Air Force (Wichita Falls, Texas). At that time the witness was surprised to see a great light on the road. Then he saw an odd machine elongated across the road at an angle of 45 degrees that prevented his passage. The machine seemed to be composed of aluminum and was about 22 meters long and 2.5 meters high and 3.5 meters wide. It had a window in the side like a porthole and was supported by 4 legs. At the top was a six-foot antenna bent backward. The machine was shaped like a fish, divided into 4 equal sections. Mr. Laxton stopped his van about 90 yards from the machine and approached on foot to about 50 meters from it; the extreme luminosity of the phenomenon allowed him to see with perfect clarity. "There were four very bright lights on both sides (...) bright enough for a man to read a newspaper from a mile away." Mr. Laxton subsequently confirmed to journalist Paul Harvey and ufologist Hayden Hewes that the thing seemed to be lit from within and "had a plastic bubble in front, a meter in diameter, and he could see light through it." The witness said it was similar to the cockpit of a B -26. At the back was a horizontal structure of about 76 cm long and a "kind of stabilizer tail." The side of the aircraft had some numbers and letters painted on a vertical black and "dark circular window. "Laxton thought it was the initials TL and the number 47 (or 41) and 68. At the bottom of the object, he perceived a gate about 120 cm tall and 60 cm wide. The hatch was open and he saw a white light inside. Under the machine appeared a silhouette of a “person” who seemed to be busy in repair functions of the machine, using 'something' like a flashlight. The “person” noticed the presence of Laxton and climbed into the object via a short ladder. Asked about the appearance of the “person,” the engineer said he had a height of 1.5 meters and about 80 kilos and Laxton estimated the “person’s” age between 30 to 35 years. "He wore a two-piece suit like a green military uniform with a "baseball cap.” He thought it had three bands above and three below on the sleeve (like the stripes of a sergeant major). The bands were in a bow and below the lines are in a more broadly V."
When the door closed, the sound produced was like "metal hitting metal." Moments later Laxton heard a noise like a drill running at high speed, then the huge metallic “fish” rose from the ground to about 15 '5 feet and disappeared at high speed, about seven hundred kilometers per hour, toward the Red River. After the machine left, Laxton said he felt static electricity in the air, "the hair on the back of my neck stood on end and [on] my hands." Following the departure of the strange "fish" metal, Laxton drove for a little over a mile until he found a truck parked beside the road. The truck’s driver, Anderson C. W. Snyder of Oklahoma, said he had seen, in his mirror, a light towards the river. No other vehicles traveling the road saw or reported the aircraft. Days later, after learning of the experience through the local newspaper, Laxton was interviewed by researchers at Northwestern University, Institute of Atmospheric Physics, and the U.S. Air Force. "I was interviewed by 25 or 30 people -- generals, majors, captains, sergeants, clerks, and stenographers. They had me draw pictures of the object and tell everything I knew about it. They asked the questions and I answered ". The electrician told investigators that the USAF commanders were very upset that the press had gotten the story before them. After presenting a full report at the home base where he taught, a colonel, accompanied by several officers, asked him to lead them to the exact location of the sighting. "We were there about 30 or 35 minutes. I answered more questions while several men searched the area. I got the impression that they knew what they were doing." “You saw a helicopter," one officer said sharply. "March 23, 1966. Temple, Oklahoma. 5:05 tomorrow. The instructor, Eddie Laxton of Sheppard AFB, while driving in the U.S. W Highway 70, found his way blocked by a fish-shaped plane landed on the road, about 23 meters long, almost 2.5 meters high, 3.5 meters wide, with a Plexiglas bubble at its top with bright lights ahead and astern. Laxton stopped his car about 91 meters of the device. He walked toward the object to about 15.5 meters away, watching some letters TLA138 or TLA738 [or TL 4768]. He saw a Do men [sic] with a baseball hat, which [went] up a ladder to the object, then immediately the object made a sound like a whistle or a drill and went to the SE at about 700 mph. (1,100 km per hour). No trace of the landing. Laxton found another witness, C. W. Anderson, [about] a mile [away]." William Laxton likely approached the machine at a distance of close to 15 meters, identified by the official survey, otherwise it is difficult to conceive of the 50 meters that the various ufologists reported about the incident, which wouldn’t allow Laxton to distinguish so many clear details of the aircraft and its crew or the bands that were on the "suit." It is also noteworthy that the object started to rise with a speed estimated at more than 1,000 kilometers per hour. This detail is significant because such haste in its departure would indicate that it was a prototype of a large transport helicopter being tested or that it was some kind of prototype airship. It happened in the city of Poast, Ohio on October 4, 1965, when at about 18:45 pm, Mrs. Helen Tucker and three girls were in her vehicle, traveling around town, when they saw a bright object in the sky, with flashing red and white lights that gave off sparks of color. From the car, Mrs. Tucker watched as the UFO landed on Carmody Blvd beyond the depression of the river. Then the strange UFO took off vertically towards the airport; its luminous appearance reminded the witness "to that of a Christmas tree." The detailed description of the aircraft indicated a red object "as cast iron," with bright wings that protruded from the fuselage, and a cockpit that appeared as a transparent vault at the top. "[It] worked like a helicopter but possessed great speed," said the witnesses. Sergeant David Moody, based at Wright Patterson Air Base, failed to identify the aircraft observed by the women, but found another witness, a pilot. The police department confirmed the existence of others who had seen the presence of a strange light in the sky. Eight years before William Laxton sightings in November 1957, there was an interesting case that bears some similarities with that reported by the electrical engineer. Again, we find the description of a UFO light in the middle of the road, and the observation of letters and numbers on the fuselage. Our protagonist, Haskell Raper, was driving home during a rainy night when he spotted a light on the road which he thought might be a truck. Suddenly, from that "thing" came a powerful beam of light that stopped his car about 5 meters from the scene. Haskell then found that this was not a truck. It was an oval object about 5 feet long and 3 meters wide, green, like a military vehicle. To his surprise, on the fuselage of the object were the letters “UN” followed by some numbers that he could not remember. Excited, Raper, while watching the scene, experienced an intense heat wave that came from the object, and his car began to burn rapidly. In terror, he jumped out of his 1956 Ford which was destroyed by fire. The UFO then rose, emitting a sound like a diesel engine. Haskell Raper ran over 2 miles until he came to town to tell his traumatic experience. The only vestige of his sighting was his burnt car in the middle of the road. Few events, such as that as experienced by Mr. Laxton, demonstrate the remarkable ability to recreate the UFO phenomenon by "staging" a hodgepodge of symbols easily identifiable and especially assimilated by the witness in an abnormal context. The military clothing of the occupant of the device, including "baseball cap" and the letters and numbers spotted on the side of the aircraft, were all elements familiar to the witness from his work in a military environment. Even the work of “inspection” of the aircraft by the pilot perpetrated a very human resort: "the repair of damage with a flashlight in hand." No doubt this close encounter was part of a studied theatricality but sufficient strange elements" to make the witness believe that what appeared to him was an “alien landing." Keel, in his aforementioned work, confirmed this fact, "these objects [are] chosen most often [to] appear in forms that can be easily accepted and explained to our own satisfaction." It is curious that the extensive knowledge of the witness on military aircraft fittings was represented in his experience in a way so clear, to "suspect" his imagination to contribute to a "construction involuntary" of an "close encounter" adding with these individual military items, to facilitate comprehension. Neither should we forget that the experience seems to pass in a "portion" of reality away from everyday life, because during Laxton’s inspection, there were no vehicles on the road, as if an "invisible bubble" had taken place away from the scene of our space and time, giving Laxton an air of dreamlike own or mystical experience. The outstanding researcher Jacques Vallee said in the book “Dimensions” in this regard: "The flying saucer enthusiasts believe that UFOs are simply machines used by visitors from other planets. This belief is totally naive. The explanation is too simplistic to account for the diversity of behavior of the occupants and their relationship with humans. The visitors would have fun, masking the real nature, and infinitely more complex technology that generates the sightings." To conclude: "His statements can not be reduced to spacecraft screws and bolts. The UFOs are physical manifestations impossible to understand outside their psychic and symbolic reality. We are not witnessing an invasion of beings from elsewhere. It is a spiritual system that acts on humans and uses humans." The researcher Salvador Freixedo’s classic and indispensable work, “Visionaries, mystics and extraterrestrial contact” is vital to the understanding [that] some UFO experiences "can actually say that the whole UFO phenomenon is greatly distorted. And this is further aggravated when we realize…that the UFO phenomenon… is intentionally distorted so that our mind will [find it] impossible to reach the real causes that produce it. The adventures and crazy things that very often [happen to] those who claim to have been in contact with UFOs has caused them not to believe anything about the whole phenomenon because of this distortion to the mind…"
Michel Carrouges, in his legendary book "The Martians Appear," includes a case that illustrates perfectly this line of inquiry: "The incident occurred October 12 1954 at about 21 hours in the field. Therefore, it whould be dark. An agricultural worker of 48 years, the witness, was alone. Suddenly [he] saw a "saucer" in the soil, 2 feet from him. It was shaped like a car, a "RENAULT 4 CV," and had wheels. [There was] a pilot with an Hallab edge of 1.50 m., [who] was garbed in a cap and a leather jacket. Challenged by the witness, the pilot did not respond and jumped on board the machine, about 30 feet over the road, and took flight as an airplane." Carrouges can not hide his dismay at such an inscrutable episode: a close encounter with a flying saucer that had wheels, "The description is so baroque that we should put aside this incident, but since it is contained in a line of Aimé Michel’s Orthotony, the incident must then be objective [sic], but its content dark and unusable." These types of events lead us to propose the thesis that by some unknown mechanism or capacity, the " intelligences " that control the phenomenon of UFO are able to "tune in" to our mind when we are close to establishing contact, and “they” extract from it information to form the staging that will occur, including the appearance of the UFO (wings, wheels, windows, symbols, etc. ), crew (height, clothing, etc.) and even the same behavior of the humanoids (observer, collector, aggressive, et cetera). These episodes are disconcerting, so different from each other, and they differ between witnesses. Being in close collaboration with our psyches, these " intelligences " make and unmake our observed experience, enriching the observation, our culture, folklore, beliefs and even our personalities, thus distorting the true reality and moving us away from any certainty of finding an answer to their real existence and purpose. The "channeling" and interpretations of some of the close encounters through our particular mental filters, magically allows the witnesses to become co-creators and interpreters of the anomalous experiences we are perceiving. A true "cosmic theater" that we wrote part of without being aware of it, a device whose purpose is to perpetrate deception, deceit, and mockery of goals and objectives that we cannot venture. John Keel: "The real problems that lie behind the UFO phenomenon are so complex and so startling that at first they seem incomprehensible. Much speculation beliefs and popular reports are based on prejudice, and misunderstanding and the inability to see beyond the limits of any frame of reference that you are using."